This page will spotlight items in the Newsletter. Each issue of our quarterly newsletter has a spotlight article on an organization, item, building or business. We also feature some of the early pioneers and citizens of Goodhue. Please check these spotlights periodically as they will change, but to receive more frequent spotlights, please become a member as they are published in the Membership Newsletter. The Blind Pig was not blind. In fact the blind pig was not a pig. The Blind Pig came into existence in 1877 when Goodhue Township voted against granting a liquor license for the sale of intoxicating liquor. Before Goodhue Village was incorporated in 1897 it was governed by the laws of the township. By 1888 the railroad was completed between Red Wing and Zumbrota and the township was jolted out of its peaceful existence. Over 600 men came to prepare the road bed for the new railroad and the town soon found illegal ways to provide liquor to the railroad workers. The Blind Pig was born. 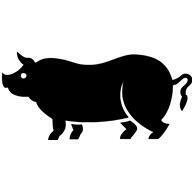 The Blind Pig was given this name because there was no visual contact between the buyer and seller. It was operated by means of a wall with a drawer into which the customer placed his money before sliding the drawer to the other side of the wall. Someone on the other side placed a bottle in the drawer and slid it back. The size of the bottle was determined by the amount of money placed in the drawer. County authorities were aware of the Blind Pig in Goodhue township and in other parts of the county, but since they had to travel by horseback and had no fast means of communication, they could not move fast enough to catch the guilty parties. The township voted to grant a liquor license to J.P. Ahren on January 3, 1891, since they thought it was better to sell a license for $500 and have some control than to allow the illegal sale of liquor. Controversy continued until the president of the Women’s Temperance Union in Red Wing wrote to the Minnesota Attorney General who ruled the commission could not issue a license since the township had voted in 1877 to forbid the sale of liquor. Ahren closed his store, but rumors persisted that the Blind Pig was as frisky as ever. In 1891 a reporter for a Red Wing paper reported that there were no drunks on the streets of Goodhue. Another reporter said he was suspicious that the poor pig in Goodhue had succumbed. “this seems a little too much to believe”, he wrote, “the pig may only be sleeping, preparing to take a fresh lease on live…It will never do to believe a pig is dead until you have attended the funeral”. The county attorney’s office hired a private detective from Mpls. to gather evidence against the Blind Pig operators. The detective approached the operators with an offer to squelch the evidence for a price. When he wasn’t offered enough to satisfy him, he offered to sell the evidence against the operators to Jonathan Finney and Francis Davis. They turned the receipt for the money into the county attorney and the detective was arrested, found guilty and fined $300, but evidence against the Blind Pig was lacking. The lead story in the Advance Sun in March, 1893 was “Goodhue Goes Wet”: They Vote License to Blind Pig Town.” The vote was 41 for selling liquor and 36 against. The vote in favor ended the ban on the liquor license ended the need for the Blind Pig. The anti-license people blamed blocked roads for their defeat, claiming that the location of the voting places made it easier for the pro license people to get to the meeting. The first liquor license was issued by the Village of Goodhue on June 28, 1897 to Henry Nibbe and Fred Holst.